Something as special as a birthday party for America just isn’t a celebration without an awesome dessert table. These fourth of July dessert ideas that dazzle will certainly make your buffet sparkle and shine. Fruit drinks and layered drinks quench thirst. 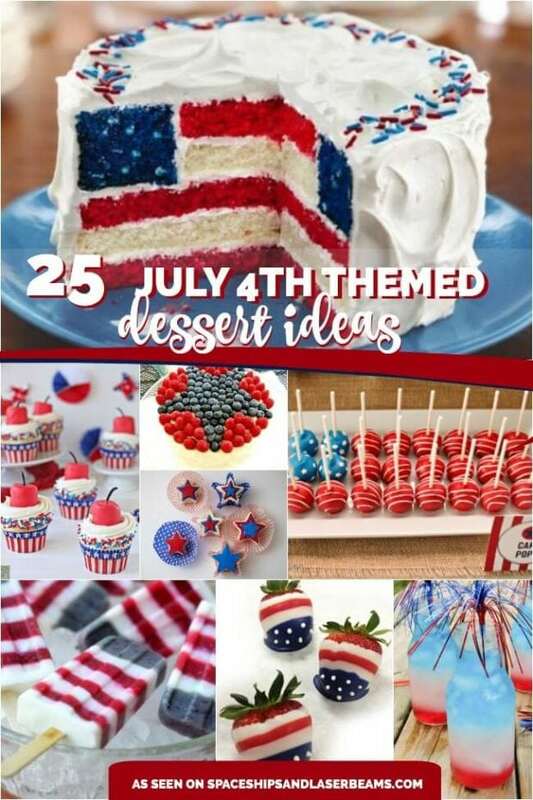 There are cakes, cupcakes, pies, ice cream sodas, popsicles, fruit skewers, chips, popcorn, cookies, puppy chow, and candy with all sorts of stars and stripes. Don’t miss these 40+ Summer Recipe Ideas for great family cooking. Get ready for the celebration with these July 4th Decoration Ideas That Wow. These cute little confections are entirely edible—even the “firecracker”! They are simple to assemble, despite being surprisingly realistic! Can you believe that the firecracker topper is actually made from a marshmallow dipped in melted red chocolate coating and topped with a black licorice “wick”? When you need to put together a quick 4th of July dessert that everyone will love, this Rice Krispie Treat cake may do the trick! It’s simple to make and easily formed into tiered layers, just like cake! Some ribbon and a few printable fireworks inspired toppers—“Snap, crackle, and pop”—pull the look together! You can have an impressive dessert on the table in less than 30 minutes! Incorporating red, white and blue to your dessert table doesn’t get any easier than adding fruit! A couple of extra minutes spent arranging blueberries and raspberries into a star formation gets you this healthy, show-stopping dessert! This red, white and blue flag cake looks like it would be more effort than it’s worth. Not so! This recipe breaks apart the simple method for a cake that will definitely wow your 4th of July party guests—and it uses Betty Crocker cake mixes as a short cut! Want to make an impression this 4th of July without much effort? These layered drinks make an easy and festive addition to patriotic celebrations. The secret is choosing a combination of red, white, and blue drinks with differing sugar content, which are layered accordingly. Keep in mind, the beverage with the heaviest sugar content should be poured as the bottom layer. A perfect recipe for a fun celebration: smokin’ hot 4th, friends, and a patriotic ice cream soda bar. Putting an ice cream soda bar together for your 4th of July party just requires a shopping list of the essentials (ice cream, red, white & blue soda, cups and spoons) and a list of toppings and extras suited to your/guests tastes (things like whipped cream, cherries, sprinkles, mini chocolate chips, Pop Rocks, etc). Don’t forget a big bowl and ice for keeping your ice cream cold during “open ice cream bar” time. Kids will love how festive these red, white and blue fruit skewers are, and you will love serving up a little fruit, mixed with all of the sugar! Layer strawberries, blueberries and pieces of angel food cake on skewers for a great 4th of July treat! Add Gina’s cheesecake yogurt dip for extra accolades. In only 3 steps, you can whip up these perfectly patriotic mini star cakes for your 4th of July shindig! Hey—this sounds pretty easy and they look awesome. Store bought buttercream and pound cake mean these work great for even a last minute dessert option! This idea for fruity ice drinks is so simple, it would be a shame NOT to include it in your celebration. You’ll need a star-shaped ice tray to fill with fruit—raspberries and blueberries—covered in water. Cranberry ice cubes are made in a regular ice tray with cranberry juice. Once frozen, add the fruity ice cubes to sparkling water or champagne and serve up in clear glasses for presentation. What’s not to love about these red, white and blueberry popsicles that feature yogurt, fruit and no added sugar or colorings? People both young and old will love this healthy and refreshing treat on the 4th of July. Gluten-free and full of flavor, this frozen red, white and blueberry ice cream pie promises to become a favorite at your 4th of July celebrations. Doesn’t a granola crust, frozen yogurt pie and berry sauce sound divine? Whether you know how to make your own cake pops or hire someone to make them for you, this patriotic cake pops arrangement can add that perfect 4th of July flair to your dessert table this year! You’ll need 4 cake pops coated in blue candy melts with white star sprinkles and 20 coated in red candy melts with white candy melt stripes. Arrange them to mimic the American flag! Why serve “normal” chips for the 4th of July when you can serve beet and blue potato chips in cute patriotic paper cones? Martha shows us how to make the clip art cones; specialty chips make this special! Whip up these super quick mini tarts for your next 4th of July party! Pre-made pie dough, canned pie filling and an egg wash are the secret ingredients behind this easy-to-make dessert! If you’re anxious to create an explosively delicious dessert and have a little time on your hands, this firecracker cake recipe looks like a fun one for the 4th of July! The base of this dessert is a white cake mix, divided into 3 equal amounts, with blue and red food coloring used to create the 3 different colors of cake. Once the baked cakes are cut into circles and the centers have been removed, they are stacked and filled with Pop Rocks for a fun surprise! A licorice wick hides the surprise flavor explosion! These patriotic Oreo pops are an easy way to get smiles from your Independence Day guests this year! Just follow the simple tips for adding a sucker stick to an Oreo, dipping it in white chocolate and covering it in patriotic colored sprinkles. A cookie on a stick and a pre-made cookie at that. Though the name may make you think otherwise, this patriotic puppy chow is a fun 4th of July recipe for people, not pups. It’s a popular recipe featuring Rice Chex cereal, powdered sugar, oil, white and strawberry cake mixes, and red, white and blue vanilla candy wafers! There is a little microwave use for melting the candy wafers, but no traditional baking is involved. Get ready to party like it’s 1776 with these 4th of July cupcakes with edible white chocolate fireworks! The secrets behind these cupcakes are two-fold. First, boxes of berry blue and strawberry Jell-o are used with a white cake mix to create the cool cupcake layered effect. The fireworks were made from piping white chocolate candy melt fireworks onto wax paper and adding sprinkles while they were still wet. Genius, right? You have to work fast in this vanilla fudge meets red and blue tie-dye design that is perfect for the 4th of July. Only 5 ingredients + foil and food coloring and about 15 minutes are needed to make your tie-dye fudge dreams come true. No, you don’t need rubber bands to tie-dye the fudge. If dipped strawberries weren’t popular enough, this star spangled version definitely ups the cool factor. Guests will love the presentation and taste! You’ll love how easy they are to prepare layering red, white and blue candy melts and pipping on some candy melt “stars”. No time to bake? No problem. This huge bouquet of lollipops can serve as a table centerpiece and become a 4th of July take home favor too! You’ll need a round Styrofoam ball, vase and plenty of Tootsie Roll Pops in red, white and blue wrappers! These soft and chewy icebox pinwheel cookies might just set off a flavor explosion in your mouth this 4th of July. But the best news of all is that they can be made ahead from basic pantry ingredients and stored in the fridge until you’re ready to bake them. If you love the sweet, melt-in-your-mouth (with a bit of crunch) taste of meringues, you’ll definitely want to check out the recipe for these red, white, and blue meringues. They are so fun to make since they lend themselves to being flavored, colored and shaped in a variety of ways! We love how some red and blue food coloring transformed these into something perfectly patriotic for Independence Day! Star shaped cookies topped with patriotic fruit—what a wonderful combination for the 4th of July! The buttery shortbread cookie recipe only calls for 3 ingredients. And the frosting is a simple spread of cream cheese sweetened with powdered sugar. Don’t even think about having a 4th of July party and leaving out the popcorn! This Almond bark popcorn couldn’t be simpler to make! Just mix together freshly popped popcorn, melted vanilla almond bark (or white chocolate), and red, white and blue sprinkles!